Lawmakers’ plans to increase taxes on the wealthy range from higher marginal income tax rates to wealth taxes. Erica York for the Tax Foundation demonstrates through historical tax data that neither may work for several reasons, including the higher the tax rate, the greater the tax avoidance. 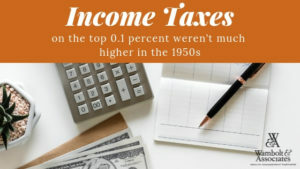 The top 0.1 percent of taxpayers pay nearly the same average tax rates today as they did in the 1950s because of other changes made to the tax system. 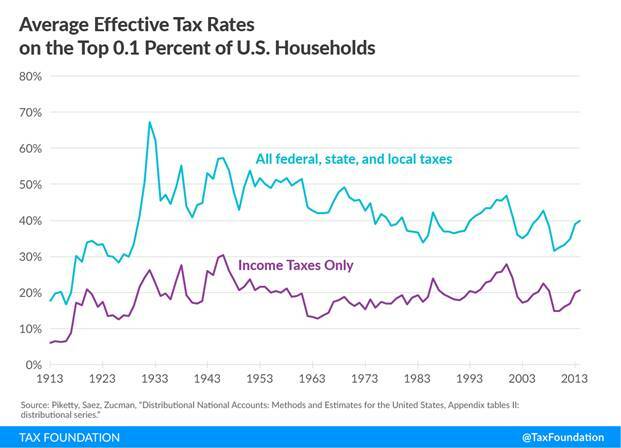 While marginal income tax rates have come down from their highs of 91 and 92 percent in the 1950s, changes in the tax base (how much and what types of income are subject to the tax) mean the effective rates on the wealthy haven’t changed nearly as much. While the average rates for total taxes on the top 0.1 percent have fallen 10.8 percentage points from the 1950s, average income tax rates have remained relatively stable. IRS data shows that there is typically a lot of churn among top earners so who is getting taxed at the high-wealth rates fluctuates. Read the full article at the Tax Foundation.